that was until we started driving up to Bridge of Orchy to raft down the River Orchy and it hadn't stopped raining for quite some days! but the general feel was "we're going to get wet anyway"! There we all were, dressed in our lovely wetsuits (not like your arse looks 3 times it's normal size or anything) ready for the "dry" run. In the boat gets the first crew to demonstrate the "skills" that will be required for the day. Seems like a laugh when you're not in the water. Things changed when we got to the water. The put-in is just behind the Bridge of Orchy hotel but to get there you have to carry the boat along a road and over a bridge - they forgot to tell us that bit. 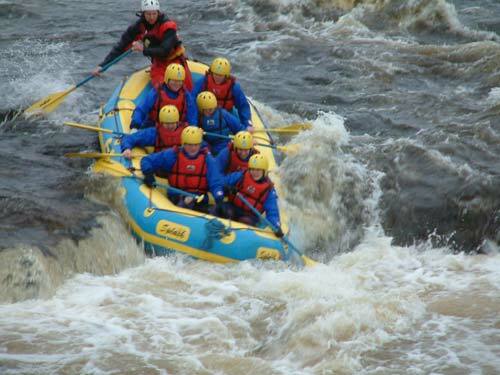 the team couldn't paddle hard enough and we ended up going down backwards. It was quickly obvious to everyone that we would have to work a little harder. 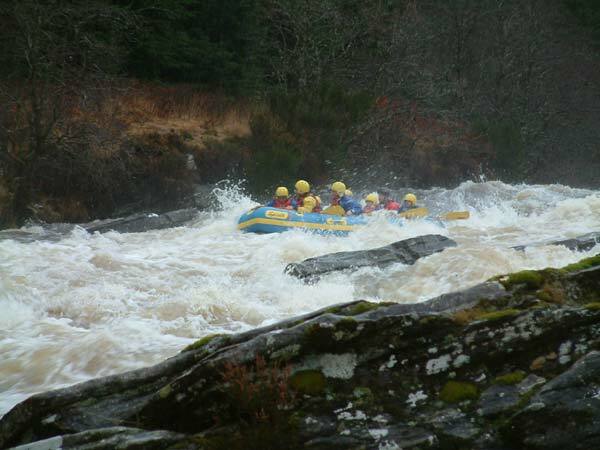 The first serious rapid is described in some guidebooks at "a rapid with a big rock in the middle" and I'm afraid I was so worried at that point that when Joe our guide told us the name it simply went over my head - as did some of the water. We were about the third boat in the water from five, however, our paddling skills were so bad at this point that when we tried to "park" in the calm area of water past the rapid (apparently called the "eddy") we ended up just a little further on than the other boats. 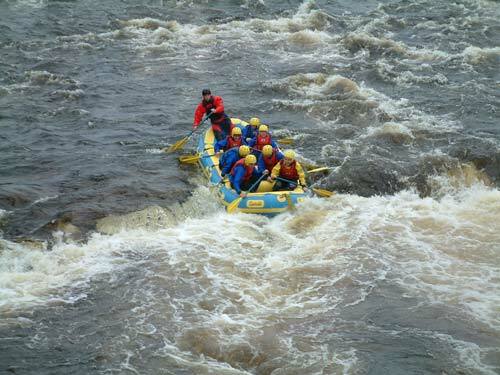 Therefore we were first onto the next rapid. This one is called Chicken Chute (which some members of the crew picked up as something slightly different). 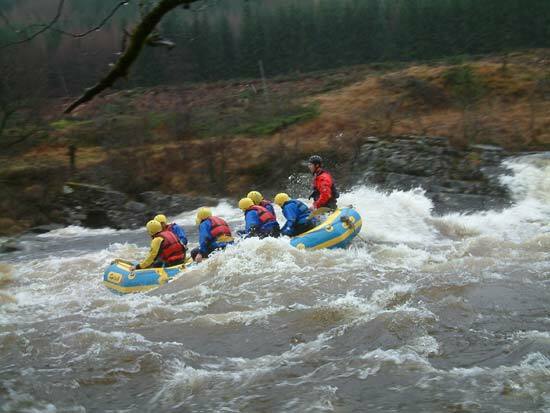 This is a big rapid in a zig zag shape and was our first real test. We had to paddle pretty fast and hard to get through it in one piece. It was also our first real taste of things to come. There were quite a lot of screams coming from the various boats by this point. Next was Sheep Trolley Gorge which is a long rapid usually known for its notable waves and holes as it channels to the right. However, as it had been raining for some considerable time, I couldn't see any holes, just loads of water coming rushing towards us. Apparently, the kayakers think this is a great rapid with lots of areas to play in. For us first timers, it was just a little scary but strangely also becoming great fun!!! 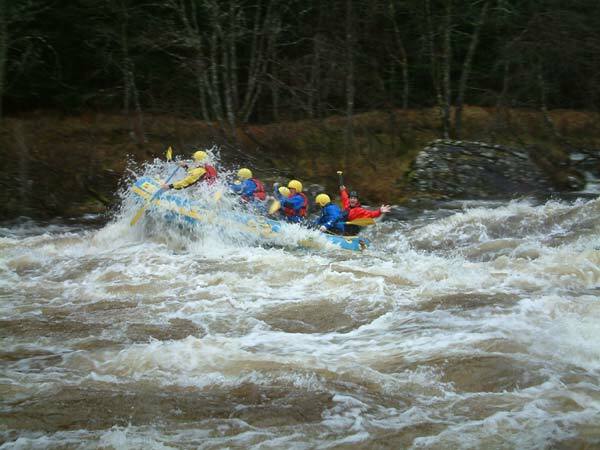 Joe, had told us that this was roughly a grade 3/4 river but there was one grade 5 rapid that we would be going down. 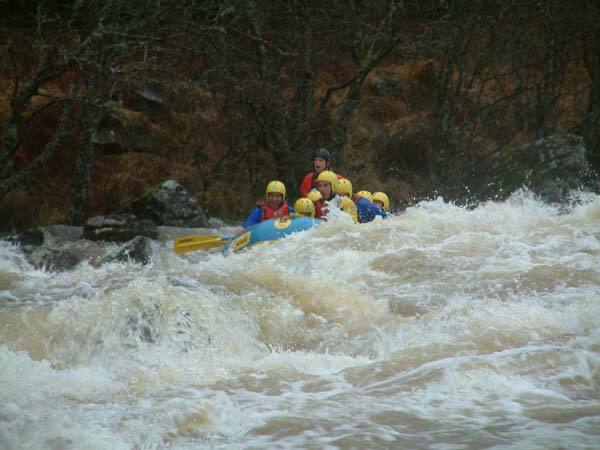 As it had been raining so much, the various guides thought it would be best to get out and have a look at the next rapid before going down it. Yes, this was the grade 5, Easan Dubha. Finally, by this time the crew's paddling skills were beginning to improve and our parking in the eddys was improving. With a bit of effort we managed to park in our allocated spot. 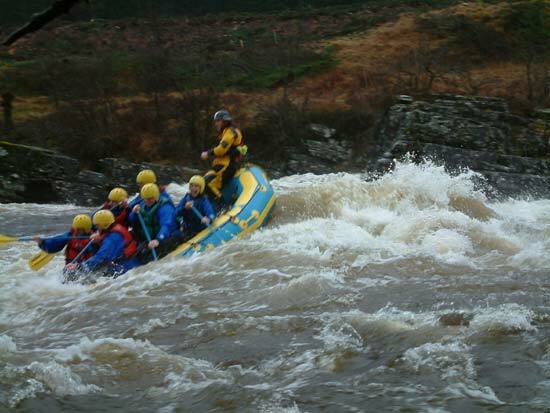 Personally I think the thought of going down a grade 5 rapid on a particularly wet day spurred us on to reach the bank before going raging down the rapid unawares. On further examination, we all thought that maybe that would have been the best plan. 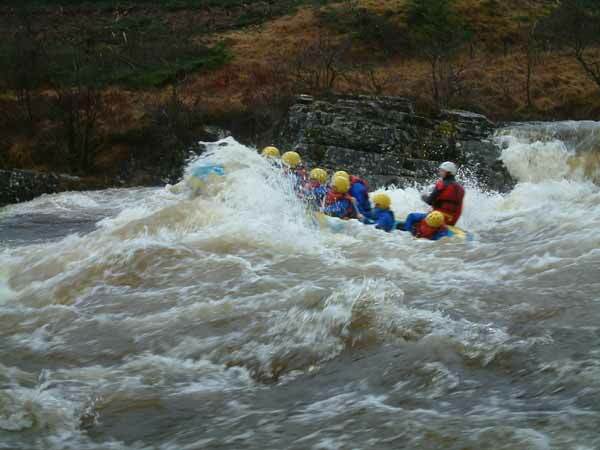 Seeing the rapid before attempting it made it even more daunting. We were to be the first boat to go down it. I think they reckoned that if we managed it, then everyone else would too!!! 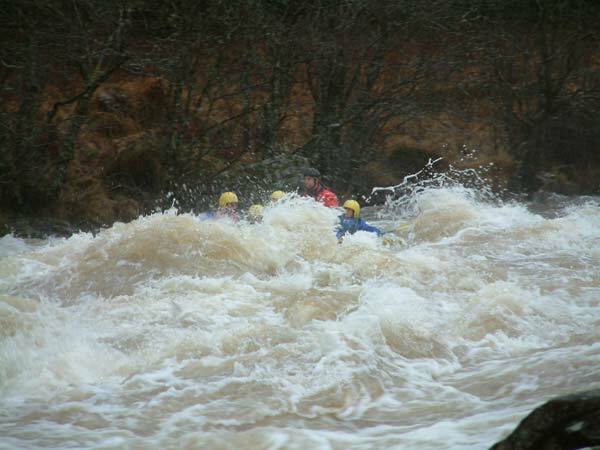 This rapid is enormous at the best of times but today, it was unbelievable. 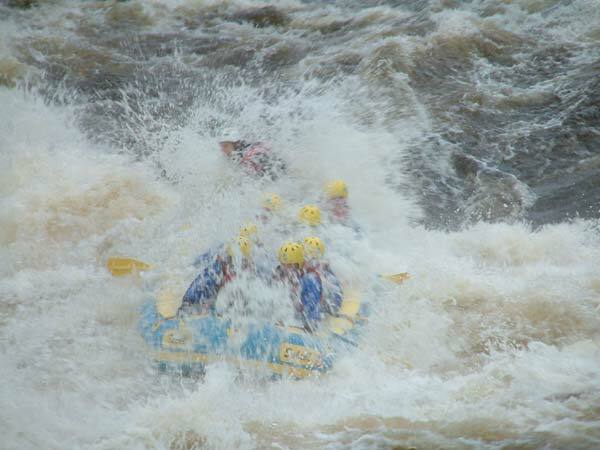 I've since seen pictures of this rapid and there are rocks in the middle which were not visible to us on the day of our rafting experience! The guide books say that you won't miss this one. That's certainly true. Unfortunately, they also say it was the site of a major rafting tragedy some years ago and to particularly respect it in high water! Some of our crew were aware of this before we started and it was mentioned once or twice which certainly increased the tension. Joe told us that we would have to paddle really hard in order to get enough power to push through the waves. We certainly did our best. When the call came to "get down" I don't think many of us have moved that fast in a long time. After the first wave, we felt like we were sitting in a bath! and although we were wearing dry cags, the water still managed to find it's way down the neck hole - oh it was extremely cold! 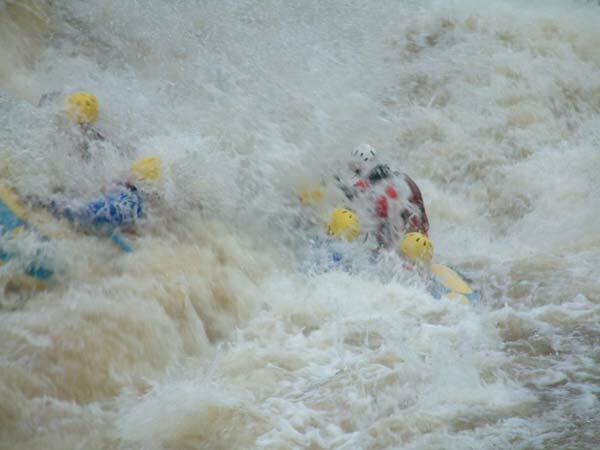 then "get down" again and through another enormous wave. Thankfully we were at the end in one piece, but oh no another boat had come down behind us and hadn't been so lucky. Three of their crew were swimming so we have to paddle furiously back towards them to get them in our boat before the next rapid was upon us or else they would have been swimming all the way through which could have been pretty dangerous. I felt when we were paddling back up that we were getting nowhere, just staying still in the water. Perhaps that was the case and the swimmers simply made their way to us! I don't know if any of you reading this have every had to pull someone out of the water before but it's not the easiest thing to do, especially when one of them has bashed his face on something and is bleeding onto the boat. Thankfully it wasn't as bad as it first looked. plus we now had three passengers in the boat. Sore Tooth then continues on and becomes Roller Coaster. Whether these are two distinct rapids when the river is running lower I don't know but it certainly made for one hell of a ride. Roller Coaster is simply as it's named. Lots of little waves rolled into one to give you the feeling that you're never going to get to the end. We successfully made it through those two, but the boat which had been behind us was now in front, and as it only had three people in it hadn't been heavy enough to make it through successfully. They had now capsized. Thankfully their guide righted the boat and got them all back in safely. I don't think we could have fitted any more into our boat. Now it was time to get out of the river for a little while. By this time everyone in my boat was having an absolutely fantastic time. Unfortunately the crew of the boat with us (which had capsized) were not having such a great time. Our crew walked back up the road which runs alongside the river to watch the other boats coming through Easan Dubha. 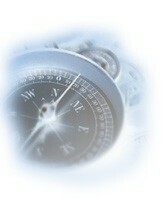 It wasn't until this time that we realised just what we had come through. Thankfully all the other boats made it through successfully and it was now time for lunch. 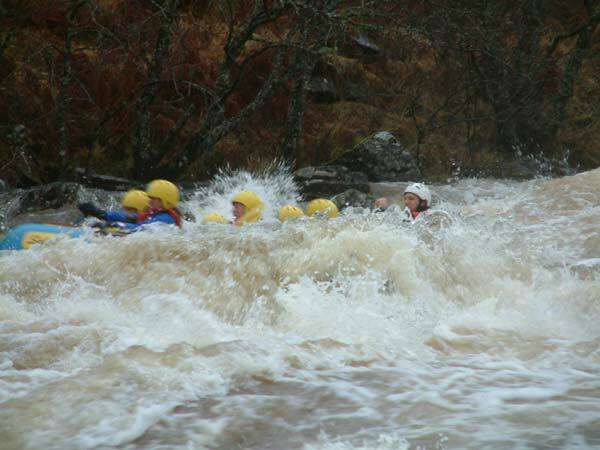 A quick lunch was all that was called for as it was still raining and everyone was wet from coming through the largest of all rapids we would encounter today, but all were full of the buzz of what we had just experienced except those who had capsized who decided to call it a day. Next came End of Civilisation. When you hear the name you think this one must be one of the worst of all, but compared to what you've just been through it doesn't live up to its name, but is still a pounding rapid in it's own right. This one is pretty similar to Roller Coaster. 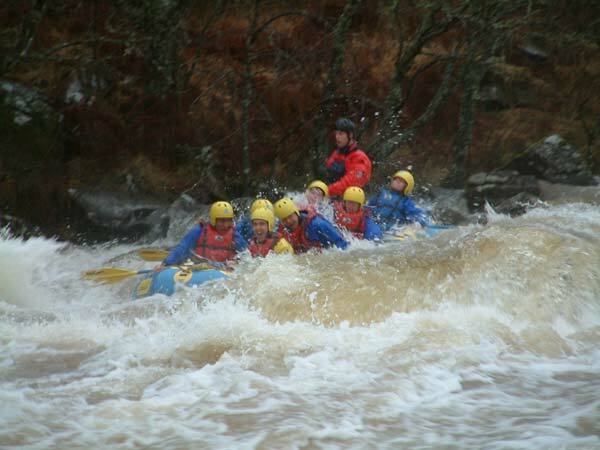 The next rapid on the river is called Eas a' Chathaidh. 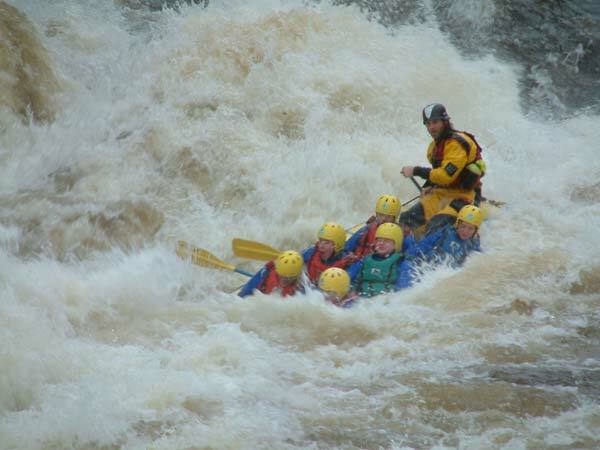 This is a grade 5 rapid but some of the guides recommend of this one that you WILL want to get out and look at this fall. 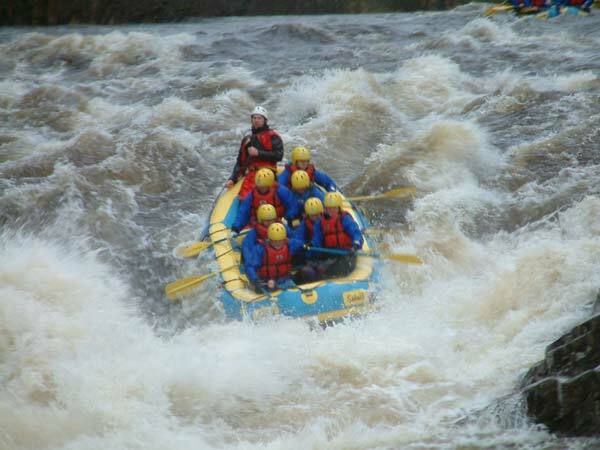 Needless to say, this one's a little dangerous for first time rafters especially when the river is incredibly high. 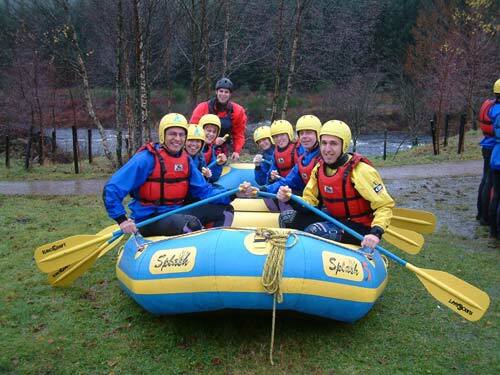 Therefore, the rafts would have to go down this one alone. Yes I did say the rafts would be going down alone. As we walked along the bank, the rafts were tied together and two of the guides attempted to jump into them as they came down the river and paddle them back to the bank. 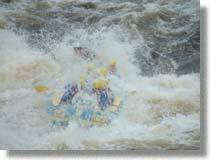 Unfortunately, the river was running a little faster than anticipated and although they managed to get in the rafts, they missed the bank. 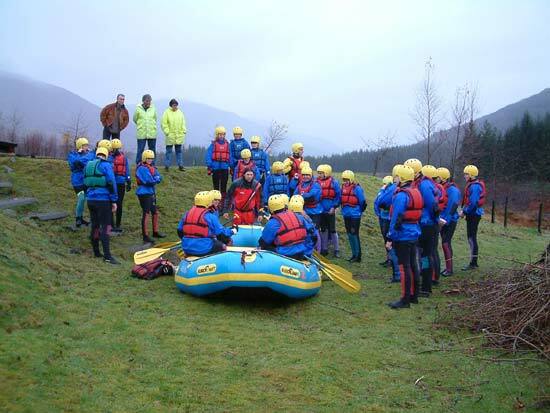 They were swept further down the river and it took quite a lot of skill, effort and safety ropes before they were able to get the rafts back into bank to allow us to re-enter. 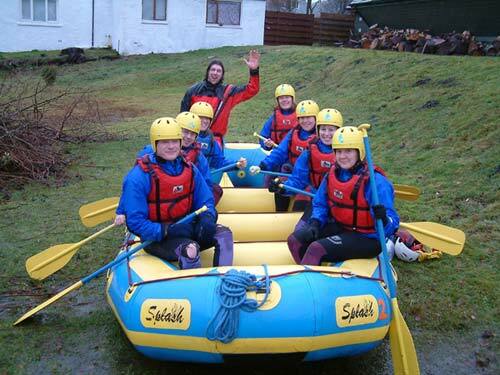 They had managed to get three of the five rafts down the river. So they decided that three boats would go down and one crew would wait until the others were finished and a boat was free to do this section. 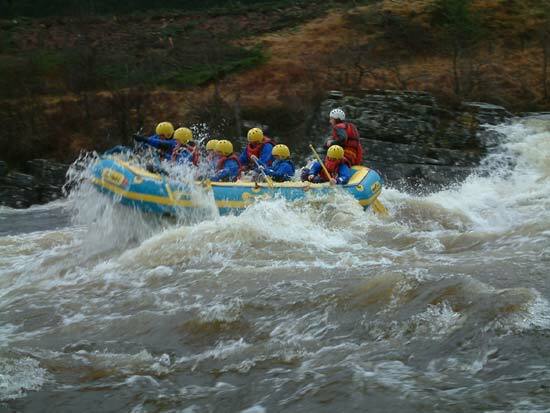 We then made our way back into the boats to do the final rapid of the day. Unfortunately, the name of this one escapes me. 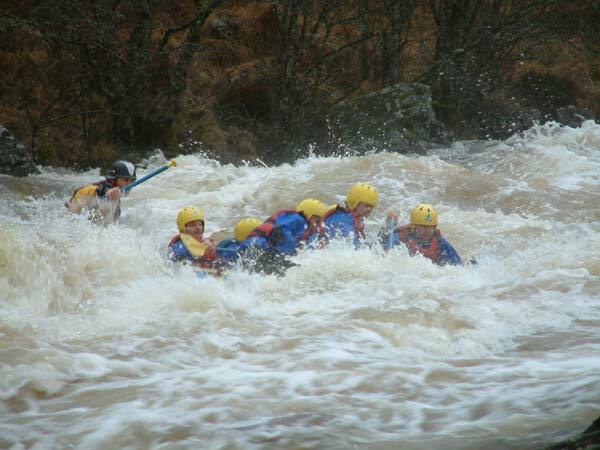 It seemed a little of an anticlimax to me as the rapids previously had been so fast and exciting and this one was a bit more tame, but it still made for a good end to the day. By this time, we were all freezing so it was a quick run in the minibus back to the bunkhouse for a hot shower. This was most welcome, as were the many drinks and dinner consumed in the hotel during the night.